For the purposes of this first part we will talk about Prime Timeline Gul’dan who is different from the movie version of Gul’dan and from alternate timeline Gul’dan. More on that later. What we know about Gul’dan’s early years is very sparse but there is much we can infer. He was a weak and frail orc in a society of warriors that prized courage and battle prowess above all else. Cleverness was seen as trickery, or at worst, cheating. The orc way was straightforward and blunt. Gul’dan was anything but straightforward and blunt. So he had a tough time, made even tougher perhaps by his stubborn refusal to accept his place in orcish society. His own clan mocked him, abused him and eventually got so frustrated with him that they tried to beat him to death. He was only saved by the intervention of the village shaman who advised him to seek out the elemental powers at the Throne of the Elements, perhaps he was more suited to become a shaman since he could obviously not become a warrior. Shaman were basically the only exception to the rule. They could be weak of body, and clever of mind and not be distrusted by the orcs. They were prized for their ability to talk to the ancestors and their power over the elements. At first Gul’dan rejected the kind shaman’s offer, but when he was exiled from his clan, and wandered the wilderness, starving and close to death, he decided if it was his only chance to be reinstated, he would take it. At the Throne of the Elements the spirits of fire, water, air and earth approached him, but whatever they sensed, deep within his heart, made them recoil violently. Gul’dan had now been rejected by everyone, his hate and bitterness consumed him. It was at this point that the fallen Eredar, Kil’jaeden, the Deceiver, second lieutenant of the Burning Legion, reached out to Gul’dan. He offered him power beyond his wildest imaginings. The power of a god. No one would pity him again, or be able to mock and beat him. He would get his revenge. All he had to do was betray his people and deliver them to the Burning Legion. Kil'jaeden made Gul’dan the first orc warlock, he taught him to wield Fel magic and summon demons, and then commanded Gul’dan to use his newfound powers to remove his past. No one must know who Gul’dan had been, or where he had come from. So Gul’dan returned to the village that had spurned him and burned it to the ground with Felfire. The next part of Kil'jaeden's plan was more subtle. He needed to destabilize the orc society to make them ripe for manipulation. Happy and contented orcs are hard to stir up and unite. Fear and confusion, this is what he needed. From Gul’dan he learned about the history of the orcs and the time in their past that they had banded together as one fighting unit and what had caused this. He learned their most sacred beliefs about their ancestors and their cherished bonds with the elementals of Draenor. This was exactly the kind of information he needed. Kil'jaeden was a master of manipulation and deception. First, the elementals. They had to sever the orcs’ bonds with these powers so that they would be frightened and weak. Gul’dan attacked the Throne of the Elements with Fel energy and when the Elemental Furies came to defend it he nearly destroyed them with the immensity of his power. This caused the elements of Draenor to be extremely unbalanced causing floods, freak snow storms and drought so severe that the orc’s main source of food, the talbuk, began to die in the thousands. And the orc shaman could not help, the elements would not answer them. Gul’dan also used his magic to spread the red pox, a horrible plague that spread from village to village killing hundreds of orcs. Eventually those affected by the pox were quarantined in a place in Nagrand called Garadar, named after the chieftain who stayed in Nagrand to lead the pox victims and who died there. He was Durotan’s father and former leader of the Frostwolf clan. Violence and desperation were spreading, the time was ripe to unite the clans, but the problem remained that Gul’dan was not a figure to inspire respect, no orc would follow him, so he must find others to be the figureheads, the puppets he would manipulate from the shadows. So Gul’dan approached the Shadowmoon clan, whose shaman were widely respected. His backstory, quickly concocted, was that his village had been raided by ogres, the orcs’ natural enemy, and he was the sole survivor. As soon as he was accepted into the clan, he immediately tried to get close to their chieftain, Ner’zhul. Ner’zhul was troubled, he had recently lost his mate, Rulkan, and the elemental spirits would no longer answer him. Gul’dan used his own story of ‘loss’, (losing everyone in his village to the ogre attack) to bond with Ner'zhul, eventually becoming his apprentice. Now, through Gul’dan, Kil'jaeden had access to a powerful and respected orc leader. He began manipulating Ner'zhul. What he wanted was for the orcs to go to war against the peaceful draenei. So far the two species had very little communication or contact with each other. They mostly left each other alone and each did their own thing. So Kil'jaeden had quite the job ahead of him to try and make the orcs see the draenei as enemies or even a threat. Ner’zhul turned out to be his ace in the hole. Through Gul’dan, Kil'jaeden had learned that the most sacred thing in the orcs’ culture was their ancestors, whom the shaman were able to commune with, through dreams, visions and when they travelled on a pilgrimage to Oshu’gun, the ‘Mountain of spirits”. All the clans would meet, twice a year, in the shadow of this great mountain, at the Kosh’harg festival. Normally very insular with their own customs and traditions, this was the only time all the clans would gather together. The shaman from each clan would meet and share information and the warriors would fight in non-lethal battles to show off the strength of their tribe. This was the perfect time for Gul’dan and Kil'jaeden to sow the seeds of war. Kil'jaeden started to appear to Ner'zhul, first in the form of his dead wife Rulkan, and then as a powerful ancestor she called “The Beautiful One”. He convinced Ner'zhul that the draenei were a threat and must be destroyed by blaming both the red pox and the elemental destabilization on the draenei. Believing these messages were from the ancestors, Ner'zhul shared what he had seen with the other shaman at the festival. Turns out quite a few of the other shaman had received visions of this “Beautiful One” as well. Word began to spread and the more aggressive clans of orcs began to sporadically attack draenei settlements and travelling caravans. Too late, Ner'zhul finally realized, when he visited the ancestors at Oshu'gun, that he had been tricked. The ‘ancestors’ who had been appearing to him in dreams and visions, were all illusions, and his apprentice, Gul’dan was in on the plot. The true ancestors turned their backs on him and his heart was crushed. This was why the elements would no longer answer his call. He was the one responsible for leading his people into war, and into the hands of the Burning Legion. Ner’zhul had been tricked by Kil'jaeden in part because he secretly wanted to be a hero. He had jumped at the chance to be the savior of his people and to play a greater part than he previously was able. When his eyes were opened he was determined to stand up to Kil'jaeden and tell everyone the truth, but Gul'dan had been been watching him carefully, and was prepared. Behind Ner'zhul's back he approached several shaman of the Shadowmoon clan and, telling them he could teach them a power greater than shamanism, he showed them his fel magic. The orc shaman had been powerless for so long, unable to help their suffering people and they grasped at this new power. Whatever their intentions had been initially, noble or not, they were twisted by the fel energies, mind and spirit, until they were loyal to Gul’dan alone. When Ner'zhul returned from Oshu’gun, Gul’dan and his followers apprehended him. They threatened to kill him if he said anything and he was cowed by their new fel powers. Slowly Ner'zhul faded into the background and Gul’dan and his Shadow Council became the voice of the Shadowmoon clan. The orcs were now openly attacking the draenei but it wasn’t going well, the leaders of the disparate clans constantly argued about tactics and struggled against each other. They were not yet the Horde. Kil'jaeden knew what they needed. He told Gul’dan to find someone to lead them. A warchief. Gul’dan wanted to rule the orcs himself, but for now he was more afraid of Kil'jaeden. Gul’dan knew just the orc. Blackhand, leader of the Blackrock clan. He would ruthlessly keep the other orcs in line and instill in them the same military discipline that he used on his own people. Blackhand had been the most successful in the raids on the draenei so that would help to convince the other orcs, but Gul’dan knew he needed more. So he approached Blackhand and told him that if he accepted the role of warchief he would grant the Blackrock clan great power, making his warriors stronger than those of the rest of the clans. He knew Blackhand would not be swayed by mere promises so he went to the Blackrock shaman and shared with them some of his knowledge of fel magic. He taught them to accelerate the growth of their young so that they became huge hulking warriors overnight. Gul’dan also told Blackhand about the shadow council, that he and the warlocks would help him to control the other orcs and their clans from behind the scenes. He did this to make Blackhand feel like he had control over both sides of power, the inner and the outer, but in truth, all the warlocks were sworn to secrecy and answered to Gul’dan first. Gul’dan did not just add orcs to his Shadow council, two other notable additions were Cho'gall the mage ogre and Garona. Garona was an outcast, half-orc and half draenei she was shunned by both races but Gul’dan saw in her a kindred spirit. She was a lot like him…..without the evil. Forced to adapt and hide to survive she became the perfect assassin. He used his fel magic to age her unnaturally and mind controlled her to do his bidding. If his shadow council discovered an orc that spoke out against their plans, Garona was dispatched to kill them. That is how the Leader of the Whiteclaw clan died. With the tales of Blackhand’s fighting prowess being spread throughout the clans, along with mysterious rumors of his shamans new powers, spread by the shadow council, Gul’dan decided it was time to call a meeting of the chieftains. At the meeting he told them himself of the new power granted to the orcs by ‘benevolent beings’ that wanted them to triumph against the evil draenei. He never mentioned Kil'jaeden or the Burning Legion, only the very few innermost circle of the shadow council knew the full truth. Not even Blackhand knew. This new Fel magic was the only way they could hope to stand against the Light magic of their enemies. Seeing the fel power wielded in front of all by Blackhand’s warlocks, the other clans shaman begged their chieftains to let them learn this new power. They too were frustrated by their inability to help their people. One and all the chieftains agreed and their shaman became warlocks. When Gul’dan suggested that Blackhand be nominated Warchief, to lead them all. The orc clans were unanimous in their support. Even Durotan, leader of the Frostwolves, who still held doubts about the validity of this war, felt he must agree or his own people would be in danger as dissenters. Gul’dan was now the leader of all the warlocks of all the clans. He was running the world, if only from the shadows. With Blackhand’s leadership and his advanced weapons, created with his clan’s elemental forges, the draenei began to lose ground. Their ship was damaged, they could not flee, they had nowhere to run, they could only retreat. They withdrew all their remaining people to the great fortress of Shattrath and the Temple of Karabor. Fortifying these cities they hoped the Horde would not dare to attack them in their stronghold. The fel magic being used constantly by the warlocks was beginning to destroy Draenor, and the elements could stand it no longer. As the great orc army prepared to advance on the Temple of Karabor, the nearby volcano erupted and out of it strode an immense firy being, composed of all the united elements, bend on wiping the orc army from the face of the earth. Cyrukh the Firelord had come. At first the orcs recoiled in fear, especially the former shaman, they saw this as a sign that the elements were furious with them for embracing fel magic. Gul’dan had to do something, if he lost the warlocks he would lose everything, they would never defeat the draenei. He realized that this was an opportunity, the elements had joined into one being, they were vulnerable, he could destroy this being and sever the orcs connection to the spirits forever. Gathering the shadow council, Gul’dan led them to the foot of the volcano and, pooling their power he cast a spell that drained Cyrukh of his energies and shattered his physical form. He then gave the energy to the orc army and they became even more powerful, marching on the temple of Karabor and defeating the draenei who once again had to retreat. Velen himself lead the defenders and narrowly avoided death. Karabor was renamed the Black temple and became new headquarters of the Shadow Council. The volcano nearby, turned green with fel energies, was called the Hand of Gul’dan. Then Gul’dan got sloppy. He liked the fact that a powerless Ner'zhul had to watch him as he planned the orcs’ destruction so he made no attempt to hide anything from him. Ner'zhul was privy to all the Shadow council meetings and so he learned of the next phase of the plan. Kil'jaeden was going to offer all the clans the Blood of Mannoroth, a great pit lord demon. He believed they would need this power to destroy the final greatest stronghold of the draenei, Shattrath. This blood would make them even bigger, more powerful and more prone to bloodlust, and it would also put them under the control of the Burning Legion. Ner'zhul sent anonymous messages of warning to try and stop the leaders of the clans from drinking the blood but only two listened to his words. Durotan, of the Frostwolf clan, and Orgrim Doomhammer, leader of the Warsong. When every other chieftain had drunk of the green pool, and ordered their warriors to do the same, they launched their attack on Shattrath. The draenei didn’t stand a chance. Velen thankfully had foreseen this and made a terrible necessary choice. To save his people he pulled the civilians out of the city, but left the majority of the warriors behind so the orcs would not see through his plan, realize they had fled, and hunt them down. Those that were left behind were essentially sacrificing themselves so that their race would not be completely extinguished. They died bravely to the last, buying the refugees as much time as they could. Velen himself wished to die with his people, he regretted leaving Karabor to the orcs and wanted to give his life with the other brave souls. His exarchs argued with him until they finally convinced him that if his people were to survive they would need his wise leadership. He must leave. Before the battle began Kil'jaeden revealed himself to the orcs, appearing before them as an ethereal figure. He saw no need to hide anymore as the orcs had drunk the blood of a demon and were now bound to his master. He told them he was one of their powerful benefactors that had gifted them with fel magic and he had more gifts to bestow before the final battle. Into the minds of the warlocks he projected knowledge of new, powerful spells that would call great fel meteors down from the sky that would crush the ramparts of Shattrath and then rise as great demons called infernals. The orcs had also built great catapults that would launch a weaponized version of the red pox into Shattrath, draenei affected by the pox would eventually mutate, lose their link to the Light and later be called the Broken. When the battle was over, many of the bodies that littered the streets of Shattrath were orc, but they had won. The draenei who had fled before the battle would spend the rest of their lives hiding from the orcs, ever fearful of being discovered and killed. 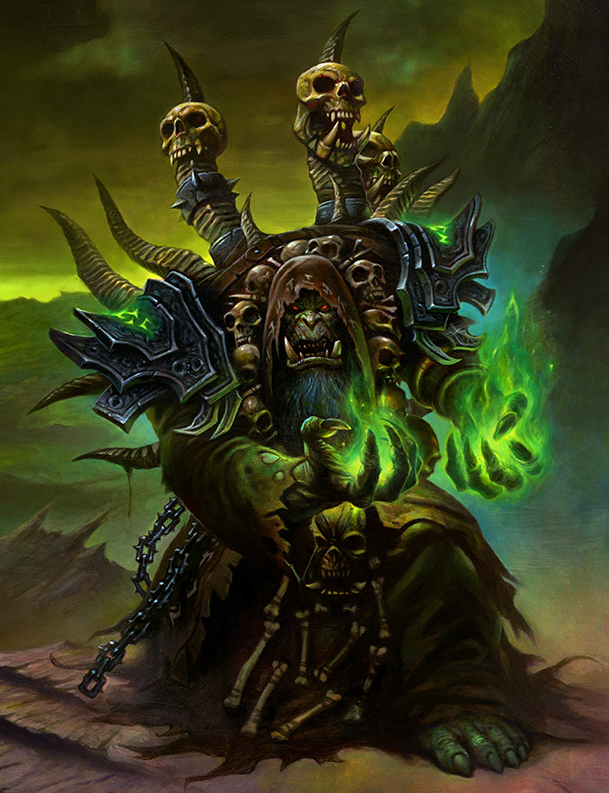 Gul’dan had used his fel magic to age the children of the orcs in days, so that they would have a larger army, he had fed his people demon blood to make them stronger and more warlike, his fel practices had stripped them of their communion with both the ancestors and the elements. He had drawn them all together into one great Horde under a single warchief where previously they had been many divided tribes. Gul’dan had changed the orcs drastically, possibly forever. The orcs did not know it but this was only stage one of the plan. They had been drawn together into one Horde, tested in battle, defeated their enemy...and now what. There was no one left to fight, and their world was dying all around them. Even Gul’dan didn’t have answers for Kil'jaeden had fallen silent. Pushed by their bloodlust the orcs travelled the whole of Draenor, enslaving or killing every other civilization they could find, and spreading the taint of fel to almost every corner of the globe. Eventually they were left with nothing but the knaw of their hunger and the fire in their blood that demanded they fight when there was no one left to fight but each other. So again they turned to Gul’dan. This is what his Fel magic had wrought. Where was Kil'jaeden? What were they to do now?